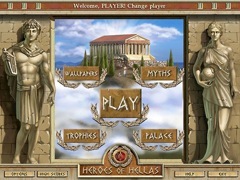 Adventures in ancient Greece make you a hero today! Someone has stolen the scepter with which Zeus controls Heaven and Earth. In Heroes of Hellas, you'll travel through Ancient Greece and into Hades to find the thief and return the scepter to its rightful owner. 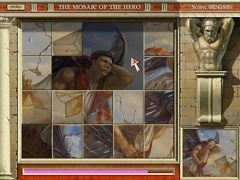 As you progress, the greatest heroes of ancient times, including Hercules, Perseus and others, will lend a hand. Even Zeus himself will provide assistance. Upon completing this daunting task, you'll earn the gratitude of the gods and see your name appear in the Assembly of Heroes. As a reward for your help, you'll explore nine exciting myths describing the awesome feats of the heroes. 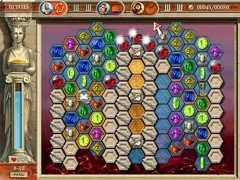 In addition, you'll earn trophies and build a beautiful palace with the help of Hephaestus, the god of the fire of blacksmiths. Last but not least, you'll be given the chance to unlock seven gorgeous mosaics illustrating the exploits of the heroes, all of which can be saved as desktop wallpaper.